Book Review The Conflict Shoreline By Fazal Sheikh and Eyal Weizman Reviewed by Sarah Bay Gachot The Conflict Shoreline: Colonization as Climate Change in the Negev Desert, a project by architect, academic, and writer Eyal Weizman and photographer Fazal Sheikh, includes a brilliant essay punctuated by stunning images. in the Negev Desert. By Fazal Sheikh and Eyal Weizman. Photographs by Fazal Sheikh. Text by Eyal Weizman. Steidl, Gottingen, Germany, 2015. 96 pp., 8x10½". The Conflict Shoreline: Colonization as Climate Change in the Negev Desert, a project by architect, academic, and writer Eyal Weizman and photographer Fazal Sheikh, includes a brilliant essay punctuated by stunning images. The bulk of these images are aerial photographs that Sheikh made on visits to Israel/Palestine between 2010 and 2015. Additional illustrations serve to support Weizman’s essay (inspired by Sheikh’s views): maps, documents, and historic aerial photographs, such as those taken for a Bavarian aerial survey of the country in 1917 as well as a 1945 British survey of the Negev desert. The Conflict Shoreline: Colonialism as Climate Change in the Negev Desert. By Fazal Sheikh and Eyal Weizman. Steidl, 2015. 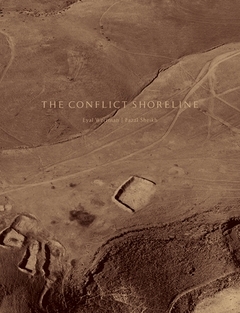 The Conflict Shoreline is a project that was born from other projects. Sheikh’s interest in Israel/Palestine had already coalesced and trifurcated into three previous projects: Memory Trace, depicting Palestinian ruins, Desert Bloom, aerial views of the Negev desert, the southern territories in Israel/Palestine, and Independence/Nakba, portrait diptychs pairing Israelis with Palestinians for each year since the 1948. These three projects became Sheikh’s The Erasure Trilogy. Somewhere along the way, images from Desert Bloom were also “committed” to an ambitious project conducted by Frédéric Brenner called This Place, a series of exhibitions, books, and an expansive online platform that engaged twelve renowned photographers to put forth their takes on Israel/Palestine. The title Desert Bloom refers to the words of David Ben-Gurion, Zionist founder of the State of Israel, who saw the desert as a place of potential abundance and Jewish settlement. The Conflict Shoreline can be seen as a continuation of Desert Bloom. Sheikh brought Eyal Weizman with him to the Negev in 2014, and the Israeli theorist began a bout of exhaustive research on the history of the Negev that now includes meteorological records, military archives, cartography, academic reports, family papers, ongoing court cases, and other documents, all convincingly woven into his essay. His thesis centers on the climate change that has resulted from Ben-Gurion’s dream of “desert bloom,” the unjust displacement of Bedouins in the Negev, and how these two phenomena are intricately and dreadfully related. Weizman reminds us that, for some, the desert (al-Naqab before 1948) was already as abundant as it needed to be. It was settled in some places and it worked as a desert – Bedouins, for centuries, knew how to conserve water, maintain livestock, and produce crops in arid territories. Whether or not the desire to make the desert bloom was to be admired, there were, and are, human and ecological consequences, and these will affect all facets of the argument surrounding the Bedouins and agricultural progress in the Negev. Also — water. Since Ben-Gurion established the system of the National Water Carrier in 1953, millions of cubic gallons of water flow daily from the freshwater Sea of Galilee to supply drinking water to Israel. The Jordan River and the underground aquifers that support the sea have been diverted and tapped for agricultural needs. The question is, is the widespread planting of forests in the Negev helping or hurting the ecological balance? The initiative is sponsored by the Jewish National Fund to support Ben-Gurion’s promise for agricultural fertility, though, from Sheikh’s photos taken from the sky, it also looks suspiciously like an intentional paving over of demolished Bedouin settlements — with trees. The book examines how Bedouin eviction and relocation has been physically etched upon the landscape: “In these images,” writes Weizman, “the surface of the earth appears as if it was itself a photograph, exposed to direct and indirect contact, physical use, and climatic conditions in a similar way in which a film is exposed to the sun’s rays. Sheikh’s images must thus be studied as photographs of photographs.” The metaphor is apt for its unconventional witness. Who else but the land can come forth to support an argument with such a complex and emotionally confusing history? Elsewhere in his essay, Weizman asserts the degree to which the land and climate is fundamentally changed by cultures seeking to profess their might. “The current acceleration of climate change is not only an unintentional consequence of industrialization,” writes Weizman at the end of the introduction to his essay, “The climate has always been a project for colonial powers, which have continuously acted to engineer it.” Weizman gives examples of other deserts and their thresholds — the “Shoreline” of his title refers to this area between arid and wet climates. Conflict rips along the crest of the Sahara in Africa as well. The political, economic, social, or spiritual incentives may vary, but throughout history and across the world, human-induced social and ecological prodding has rarely benefited all cultures involved. Hence, The Conflict Shoreline resonates loudly. What is it that we “solved” with a system of reservations for indigenous peoples in the United States? In 1913, Californians drained Owens Lake; now dust storms fuel air pollution over the entire nation. The massive mistake that is the Salton Sea, also in California, resulted from a breach of an irrigation canal — with nowhere to go, the waters are thick with agricultural run-off and too salty from evaporation for hale and hearty lake life. Blooms of algae and botulism outbreaks cause bird and fish death on a colossal scale. What have we learned from these events? Weizman’s essay in The Conflict Shoreline ends and is followed by a two-page black-and-white photograph. It’s not by Sheikh — it’s a detail from an aerial photograph taken in 1945 for the Royal Air Force as part of the Survey of Palestine under British Mandate. The image is blown up and blurry, incomprehensible for its magnification. The caption identifies it as an area key to Weizman’s essay — the al-Tūri cemetery in the generations-old but now illegalized Bedouin settlement of al-‘Araqīb, and the area that inspired Sheikh to make his aerial images. The inhabitants of al-‘Araqīb have learned to move into the cemetery when the bulldozers arrive, as it seems there is at least a respect for the dead. This blurry image, perhaps on the “threshold of detectability,” as Weizman explains it, gets to the heart of this book by posing the question, What is it that you see? For Weizman and Sheikh, this image is incontrovertible proof — if you know how to read a photograph — that al-‘Araqīb is a legitimate settlement with land rights. Weizman sees a cemetery in this picture by the darks and lights of the photographic grain. If there was a cemetery there in 1945, he and others argue, this would mean that Bedouins inhabited al-‘Araqīb land before 1948.